In this interview Valeriy shares with us his thoughts about the code, the industry and the work. As an ASME inspector, what do you think about the actual ASME code? The code is useful, modern and highly developed. I think it’s more practical that ASME code is currently updated every 2 years instead of on a yearly basis. Reviewing the addenda every year can be somewhat a burden for industrial users. It will be even better if they manage to issue a new edition every 3 years instead of 2 years. What are the most common problems you encounter when you inspect companies which have to comply with ASME Code? The main problem lies in the lack of standard procedures and sample forms in QC system and QC manuals. Each manufacturer creates his own QC system, inevitably, introducing lots of unnecessary information and mistakes. ASME provides sample forms only for WPS (Welding procedure specification) and PQR (Procedure qualification record), but not for other manufacturing activities. It will be better if ASME can include as Non Mandatory Addenda some standard QC system samples including applicable exhibits and records formats that can be directly used or served as a skeleton for further modifications. Another problem is the complex structure of the ASME Section VIII Div 1 Code. As you know, there is a lot of cross references in the code. It’s really difficult to keep in mind all the intersections, exceptions and specific cases. The writing style of the code can be simplified too: more tables, charts and visual illustrations will surely be welcomed by engineers. What are your suggestions to comply with ASME code requirements? Knowledge and experience in real manufacturing is very important. Design Engineers, especially young ones, shall have some experience to perform hand calculations and then use programs, because hand calculations give you a strong sense of design rules that they cannot acquire only with a software. How does inspection according ASME regulation help to avoid major safety problems? One CIS Insurance Company(part of Bureau Verita Group) where I work now as an AI says that “We are here to protect manufacturers from themselves”. This is true. Inspection agency controls is a good help to increase safety and quality. I can share with you an interesting story here. I met a manufacturer who wanted to perform hydrostatic pressure test at 180 bars. They were using RTJ flanges with ring gaskets. The manufacturer wanted to save some money, so they machined these gaskets by themselves. We started the pressure test, but when the pressure reached about 100 bars, the water started to leak from this blind flange. I advised to stop and change gasket. But the manufacturer’s general director was in a hurry – he didn’t want to wait another few days until new gaskets will be available. He started to pray me to continue and accept the test with such a leakage, so we could complete the test that day. Finally we reached an agreement that if, after raising the pressure to 180 bars, the vessel can pass my visual inspection, we can then consider his proposal. But of course they could not, because all the water in pump went out immediately from this blind flange. Finally they understood that it was physically impossible and postponed the test a few days later. Thank you Valerij for those valuable insights! I hope that it will help some engineers to review their design process and get the ASME accreditation more easily! What about you? 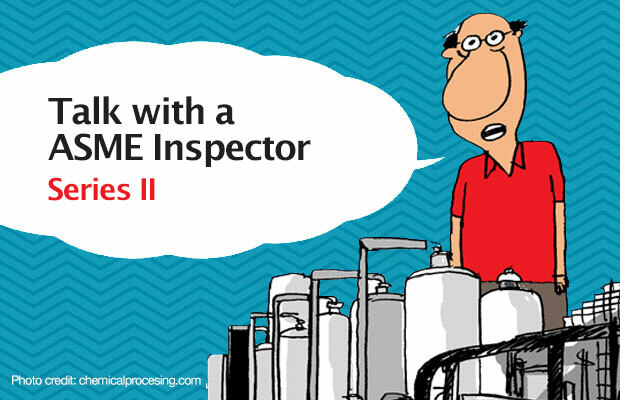 Did you have some experience to share with an ASME inspector?